We've created a birthstone guide based on the American Gemological Society, we used some of our jewelry to show the stones in action. We have plenty of options in store and would love to help you find or create the perfect piece! Garnets come in a wide spectrum of colors. Typically the red color is most often used. 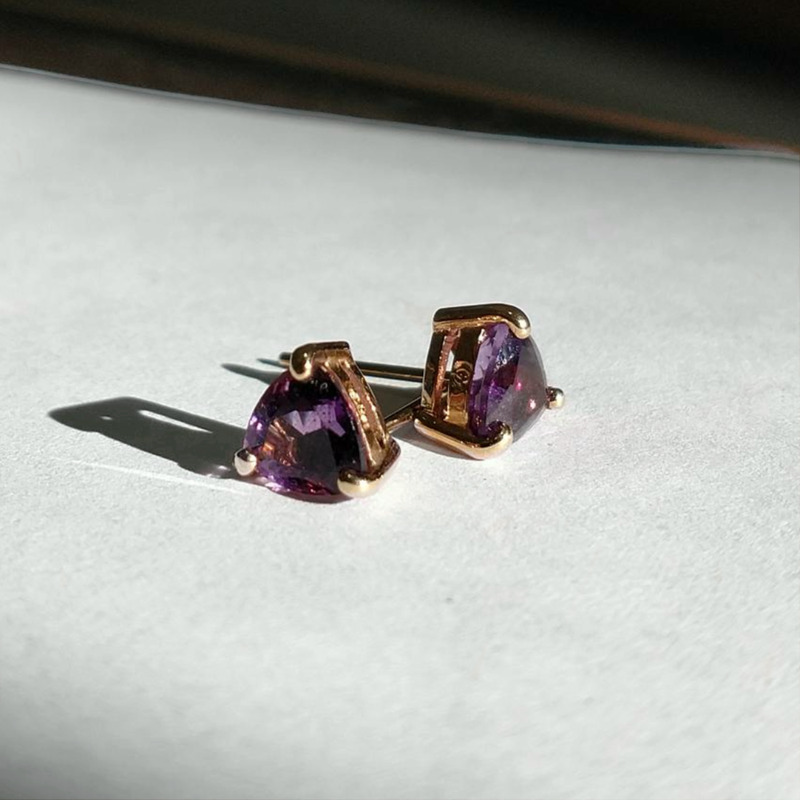 Garnet remnants were found dating back to the bronze age. They were used in signet rings found in Rome, and many nobels were known to have them. Garnets are not only used as a birthstone, but also to represent the 2nd wedding anniversary. Amethyst is a type of quartz. It gets its color from the iron impurities and ranges from a deep to light purple. These stones used to be used in high regard (like diamonds) until there was an massive supply found. Amethyst is also used for the 6th & 17th marriage anniversaries. Aquamarines are part of the beryl family (like Emeralds). They can be greenish blue to blue green. These stones are often given to brides as a symbol of long unity & love. They're also used as the 19th wedding anniversary gift. Bloodstones are dark green with flecks of red (iron oxide). They are part of the chalcedony family and are also referred to Blood Jasper. Diamonds are made of carbon and can only be cut using another diamond. There are many different colors of diamonds, currently the Blue Diamond is the most expensive in the world. They have been known to of been traded since 4BC. Diamonds are also used to represent the 60th & 75th wedding anniversary. Emeralds are part of the beryl family. The deeper the green color the more expensive it is. These stones have been known to of been mined dating back to 330 BC in Egypt. The oldest emeralds are thought to be around 2.97 billion years old. Cleopatra loved emeralds and took ownership of all the mines in Egypt. Many emeralds have inclusions, but that doesn't detract from the value of the stone. 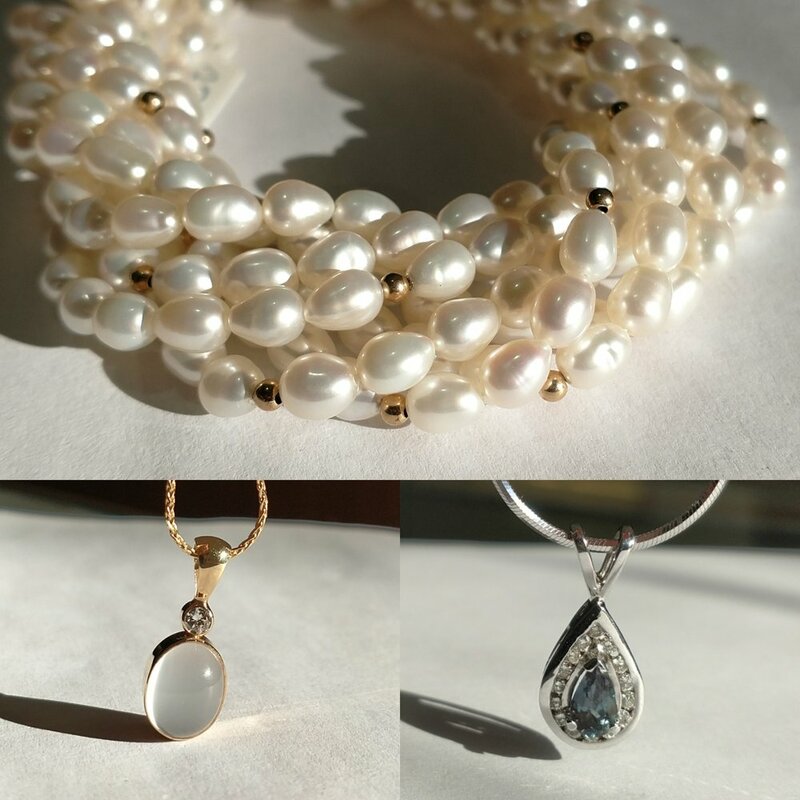 Pearls are the only birthstone made by a living creature, made up of layers of built of calcium carbonate. Most pearls are cultured & natural pearls are the most rare. Pearls are gifted on the 1st, 3rd, 12th & 30th wedding anniversaries. Moonstone is part of the feldspar family, and can come in a range of colors. Florida made this their state gem in 1970 to commemorate Apollo 11 (even though you can't find moonstones in Florida). Alexandrite is part of the chrysoberyl family & was first found in the Russian emerald mines. It's believed it was found in 1834 on the day Russian Czar Alexander II came of age (which is how it got it's name). Russian alexandrite changes colors from green to red (emerald by day, ruby by night). This is one of the most rare gems. 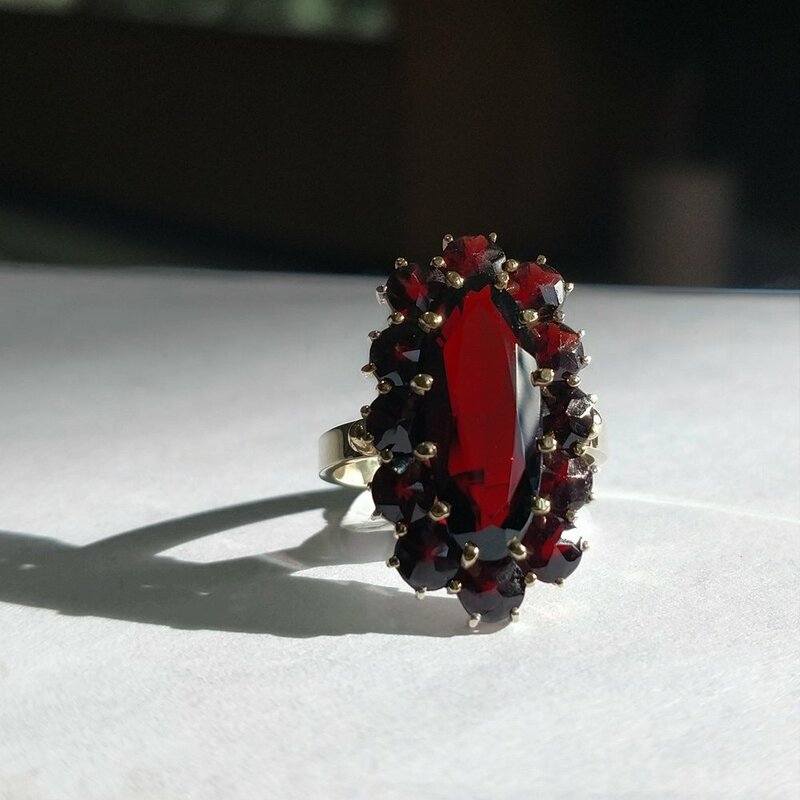 Ruby is part of the corundum family and is colored by chromium which makes rubies fluoresce. Chromium hinders rubies from growing large enough to crystallize into fine gems since it causes cracks and fissures. Rubies can cost more than diamonds when the quality is good, although natural rubies contain imperfects, it doesn't mean they cost less. Peridot is part of the mineral Olivine family. These stones are brought to the surface by volcanoes. Peridot only comes in the color green, the different shades are dependent on the amount of iron found in the stone. The largest peridot weighs 310 carats and is in the Smithsonian. Peridot also represents the 16th anniversary. Sardonyx is made up of layers of sard and onyx. The best pieces show the contrasting layers. Sardonyx is part of the chalcedony family. Sard is often mistaken for carnelian. This stone has been popular for centuries and has been found in roman seals and signet rings. Spinel is often mistaken for a ruby or sapphire. It has an octahedral crystal structure and single refraction and is not as hard, which is what sets it apart. Red is the most desirable, along with blue, pink and orange. Spinel comes in many other colors as well, black (which is pictured), grey, mauve, yellow and brown. There is even a magnetic spinel that was used in the 11th century for compasses. Sapphire is part of the corundum family and comes in a rainbow of colors, except red, which is then a ruby. Sapphires that are any other color than blue are called "fancies". The sapphire became a popular symbol of love in 1981 when Britain’s Prince Charles gave Lady Diana a 12-carat blue sapphire engagement ring. Prince William gave this ring to Kate Middleton in 2010. The Logan Sapphire, which resides at the National Museum of Natural History is one of the largest faceted blue sapphires and is 423-carats. The Star of Adam is the largest blue star sapphire, coming in at 1404.49 carats. Sapphires like rubies are used for more than just jewelry, such as, industrial applications including scientific instruments, high-durability windows, watches and electronics. Sapphires also represent the 5th & 45th wedding anniversary. Opals were discovered in 1850, it was said these stones had a "play of color" that could mimic any stone color. In the 1960's scientists realized there were microscopic round pieces of silica that diffract light to display all of the different colors. The world’s largest and most valuable opal, “Olympic Australis,”Australia in 1956, during the Olympic Games in Melbourne. It measures 11 inches long and weighs 17,000 carats. Opals are also made up of water and it can be anywhere from 3-21%. Quality stones are usually 6-10%. Opals also celebrate the 14th wedding anniversary. Tourmaline is part of a complex group of minerals with different chemical and physical properties. No two stones will look a like.They are so desirable because they come in an array of colors and their hardness. In the 1500's a Spanish conquistador found a green tourmaline in Brazil and believed it to be emerald. It stayed that way until the 1800's when scientists identified tourmaline as it's own category. In 1876 George Kunz sold green tourmaline from Maine to Tiffany's & Co which helped this stone gain in popularity. Tourmaline also represents the 8th wedding anniversary. Citrine is part of the quartz family. It's typically a pale yellow to burnt orange. The pale yellow color closely resembles topaz and they have been confused throughout history although are not similar minerals. Citrine's yellow color happens from iron in the quartz crystals, but it is rare to find in nature. Most citrine has been heat treated and was either an amethyst or smoky quartz. The largest citrine is at the Smithsonian weighing 2,258 carats. Citrine also celebrates the 13th wedding anniversary. Topaz comes in many different colors. The most cherished topaz is Imperial Topaz, which has a orange color with pink hues. Pure topaz is colorless, and can be used as a diamond alternative. Blue topaz rarely occurs in nature, and is often treated. 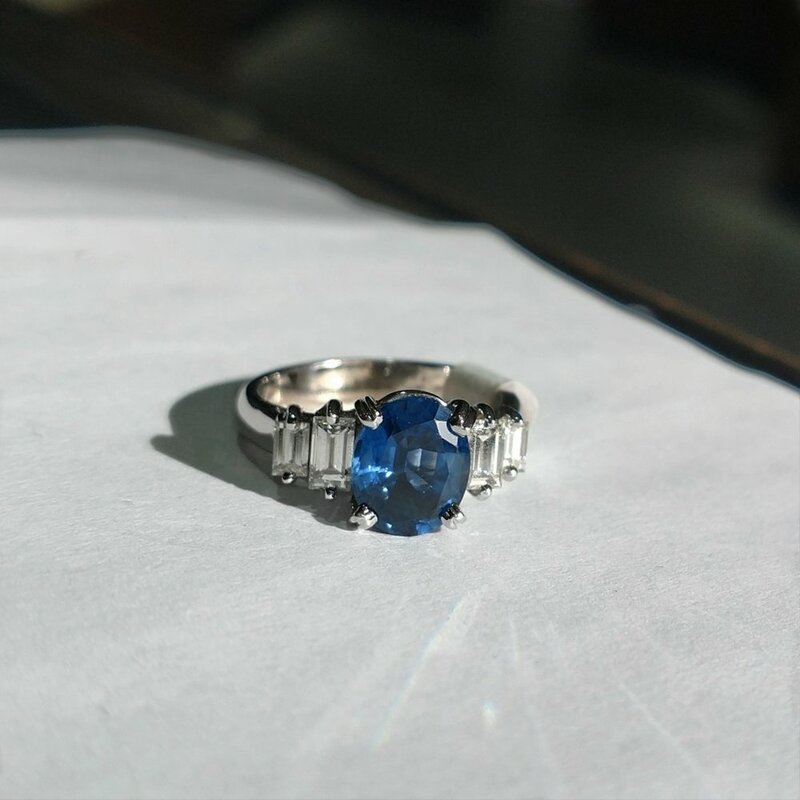 In the 1960's colorless stones were treated to turn blue and it flooded the market to make them one of the least expensive gems. Blue topaz is Texas' official gemstone, along with Utah. Topaz is also used to celebrate the 4th & 23rd wedding anniversaries. Turquoise is known for it's recognizable color. Copper gives it the blue hues, iron and chrome give it hints of green. The earliest uses of turquoise were found in ancient Egypt in tombs dating back to 3000 BC. King Tut's burial mask had turquoise on it. The Native American turquoise jewelry can be dated back to 1880. The US is the current largest supplier of turquoise. Turquoise also represents the 11th wedding anniversary. Tanzanite is the blue variation of the mineral zoisite. This blue stone is only found in Tanzania, although, zoisite has been around since the 1800s. The blue stone was found in 1967, and Tiffany & Co. agreed to become the main distributor in 1968. It's typically heat treated to bring out the blues and violet colors and to get rid of the brown shades which are natural. If the mining of this stone continues at the rate that it's been going (2.7 million carats per year) there is a good chance the mines will be empty in the next 30 years. Tanzanite is also used to celebrate the 24th wedding anniversary. Zircon comes in a wide range of colors, but typically is brown/red. Many are heat treated until they are colorless, blue or gold. Since zircon is the oldest mineral on earth, some stones can be slightly radioactive. The radiation is what helps them to be dated back 4.4 billion years, and the heat treatment also helps stabilize the radiation. The colorless zircon is called Matura Diamond, however, it's more brittle.